The Paccheri are a kind of macaroni typical of Naples: If you’ve never tried them, I recommend you do it as soon as possible! The large size and thickness of this pasta call a rich and intense sauce: to prepare this, today I bring you a ride from Naples to Rome, relishing my Paccheri with ingredients that wink to the Italian capital city. 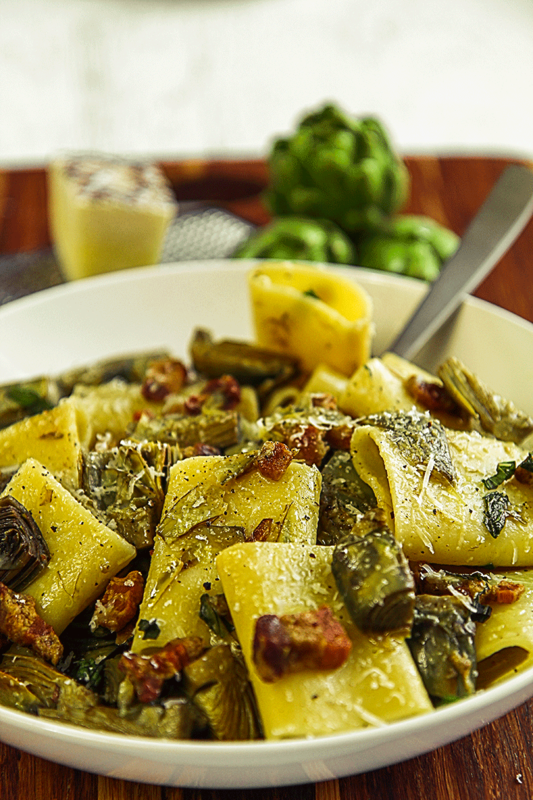 The Paccheri are a delight for those who love the taste of pasta, which is very persistent in every bite. To counter the “bullying” of the Paccheri, I suggest you a tasty “big shots” dressing with fresh pork belly, artichokes and pecorino romano cheese.